Leila writes: I just got an iPad, and I’m a little worried. When it’s plugged straight into a power socket, the little battery icon says it’s charging, but when I plug it into my MacBook it says “Not Charging.” Did I do something wrong, or is my iPad broken? Hi Leila! Like the iPhone or the iPod Touch, you can plug the iPad into your system’s built-in USB port to both sync your content and charge your device—well, for the most part, anyway. But here’s the thing: the iPad’s excellent battery life is something of a double-edged sword. Yes, you can go for days without charging the iPad, but a standard USB port is too weak to properly charge the iPad’s big, beefy battery. Now, the latest iMacs and MacBooks come with so-called “high-power” USB ports that are, in fact, capable of syncing and charging the iPad simultaneously. That’s the good news. What’s the solution? 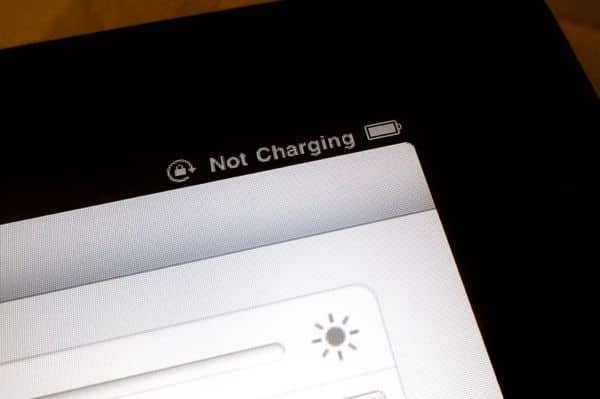 Try putting your Mac to sleep by clicking the Apple menu, then selecting Sleep; the “Not Charging” message should disappear from the iPad’s screen (assuming your iPad is plugged into your Mac, of course). Or, if you have your iPad plugged into a USB hub, try connecting it directly into your Mac. For the fastest recharge, though, you’re better off using the iPad’s included AC power adapter.